Wait, Is Star Wars: The Force Awakens' New Droid Female? There are so many reasons why we’re excited for Star Wars: The Force Awakens, but one element that has already struck a chord with fans of that far, far away galaxy is BB-8, that adorable new droid. In addition to the obvious differences between BB-8 and other droids—chiefly that it moves by rolling on a ball—there could be one other distinctive feature: BB-8 may be female. There's never been a strong female robot in any Star Wars film, J.J. (Abrams) was determined to make BB-8 cute and strong — and female. If this is indeed true, that BB-8 is supposed to be female, it will be interesting to see what, if any, impact that has on the character’s role in the film. The source also stated that BB-8 was designed to appeal to young girls, and you have to wonder, what precisely makes this particular droid female as opposed to male? The simplest idea might be that, from what we’ve seen in the trailers, BB-8 looks to be Rey’s (Daisy Ridley) sidekick and companion, and she applies the feminine pronoun, much like how Luke Skywalker refers to R2-D2 as he. That seems like it would be the easiest explanation, and the one that would fit most naturally into the narrative—that Rey calls BB-8 her, and everyone else just follows suit. If that’s the case, aside from terminology, it might not even be noticeable in the grand scheme of things. Then there’s a question of intent. Perhaps the droid’s designer, within the world of the film, meant BB-8 to be female. Maybe BB-8’s warmer, orange color scheme is supposed to denote gender. 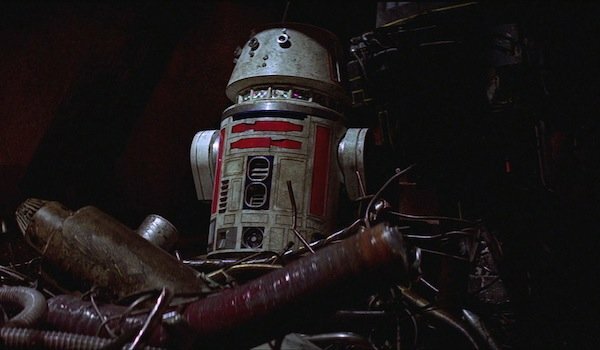 Should that be the case, it raises an interesting question about R5-D4 from A New Hope as that droid and BB-8 share a very similar paint job. Again, this would bring up the question of why? And maybe, just maybe all of that tension on stage between BB-8 and R2-D2 back at Star Wars Celebration wasn’t actually friction, but was in fact sexual tension. Is R2 getting a girlfriend in The Force Awakens? Okay, I’m kidding, but if you watch the footage of that presentation, director J.J. Abrams and Lucasfilm president Kathleen Kennedy never refer to the droid by a gendered pronoun; it’s always "BB-8" or "it." Sure, I’m likely being far too conspiratorial right now, but watching the footage below, it starts to seem intentional, especially with the frequency with which R2-D2 is referred to as "he" throughout the saga and by most people. The idea that BB-8 may have been designed to appeal to girls also fits with the larger direction the Star Wars universe is moving. They’re making a concerted effort to address gender inequality within the saga, making one of the new leads a woman and adding strong female characters all over the place. At the same time, they’re targeting their female fans outside of the movies. You can even see this in the product tie ins, like that Duracell commercial that just came out, which features a brother and sister, a young boy and a young girl, running around pretending to be Star Wars characters. Like everything with Star Wars: The Force Awakens, we won’t know how accurate this report is or isn’t until we watch the movie for ourselves on December 18, but it is something interesting to consider in the meantime. We’re also curious to see whether or not — again, if this is true — if the subject is directly touched on in the movie, or if it is simply something that’s an accepted fact.